An author of a crime story gets caught up in a real-life crime. In Black and White introduces us to Mizuno, a comically hapless writer virtually powered by a tendency to think himself into corners. The novel was penned in 1928 by the famous Jun’ichirō Tanizaki but only published in English translation last year. When we first meet Mizuno, he’s recently submitted a story about a murder to a Tokyo publication, The People. He soon comes to realize that, in the last few pages, he may have accidentally used the name of the real man upon which the fictional victim was based. This man, Cojima, isn’t even someone who Mizuno really knows. He’s just a drippy acquaintance whose face makes Mizuno think of shoe leather. Still, Mizuno fears that Cojima will read the story and recognize himself in it. Then he becomes haunted by the thought that if someone murdered Cojima in real life, he, Mizuno, would look guilty of the crime. Mizuno contacts Harada, the editor-in-chief of The People, to have the name in the story changed. Harada informs Mizuno it’s too late to do this and laughs off his concerns. Mizuno continues to worry and imagine worst-case circumstances, but soon has the idea of writing a sequel to the first story. In the sequel, he plans to create a fictional version of himself as the “author” and explore the very situation he fears. But he becomes sidetracked by supplying himself with ongoing alibis in case the first story somehow inspired someone to kill Cojima. With the intention of procuring said alibis, he fakes having gonorrhea so that his neighbors can witness him going down the hall to pee frequently. He also schemes to finagle a large enough advance for his next story to spend his evenings in the company of prostitutes. He eventually gets sidetracked from this goal, too. Before long, he’s whiling away his time with one particular woman of the night whose Western fashion and manners he finds irresistible. I was a little concerned that In Black and White might be a “story inside a story” that would be tedious to follow. This didn’t turn out to be the case. Tanizaki’s novel is a delectable page-turner with a philosophical edge. It’s arguably a bit limp in the conclusion department, however, the reader is more or less warned about what to expect. It’s also worth mentioning that, in an afterword, translator Phyllis Lyons delivers some interesting historical and biographical context surrounding the book. 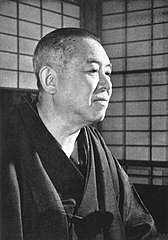 While In Black and White was written nearly a hundred years ago, the character of Mizuno feels like an embodiment of contradictions that are still present in much of consumerist society today. He idealizes freedom to the point of driving away everyone, including his wife—who we learn left him due to his penchant for writing wife-murder stories. At the same time, he remains stuck in a dead-end existence, working for advances and fueled by fleeting obsessions. He values independence, but his tastes and desires are dictated to him by others. The question of whether Mizuno is in control of his own life takes the story beyond its suspense framework, showing us a humorous nightmare vision of a human being’s tumultuous relationship with himself. In Black and White is a thoughtful and thoroughly entertaining read, set against a landscape both hyperbolic and banal. This novel has the potential to be an intellectual delight for those who have a sense of humor about the writing life, anxiety or the simple terrors of everyday existence. A new review: happy surprise on this frozen Wednesday!